The nature of the divine prefers to be hidden in diverse coverings; access to it should not be easy nor its majesty open to all. A lot is going on in the sublunar experience, in the individual person, and in the astrological chart. What is interpretation? What is being done when analysing a full astrological picture? Learning and practising astrology prompted William Lilly to declare “Ars longa, vita brevis” (“art is long, life is short”) – reflecting a centuries-old challenge of making sense from much information. No matter the level of experience, reading any chart asks to see a singular map with fresh eyes whilst consistently drawing on complex knowledge from ancient tradition. Aside from technical preliminary chart analysis, what could be foundational to ascertaining character? And where can a core understanding of the symbolism begin? In aim of ‘doing astrology’, this Intensive will address a facet of delineation dealing with scoping out the factor of temperament. Practical techniques will be reviewed and principles applied by working with different birthchart examples. 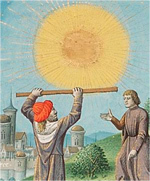 Both horoscopic astrology and temperament theory have a common link to ancient Greek ideas connected to the four elements and their informing primary qualities. The temperament model is also known as the four humours or complexions, classically called Choleric, Sanguine, Phlegmatic, and Melancholic. Together these identify distinguishing psycho-physical characteristics determined by a mixture of elemental proportions which comprise the individual constitution. They provide a fundamentally innate aspect of the disposition which contributes to the personality. Most individuals are a combination of temperaments, in a varying range of intermixture (sometimes all four), which are seeking balance. Generally, two may be more dominant, with one as a sub-tone, and one relatively absent. Often, when a certain temperament is absent, its opposite may become a strong compensation. Whilst, though rarer, there can be instances where only one temperament could be almost totally invested in. Additionally this model remains dynamic and some temperaments may appear more present at different points in life and in various areas of expression. Astrology is not digital. Components of a person’s psyche are not either ‘on’ or ‘off’. There are shades of meaning and waves which ebb and flow. Temperament is no exception to this. While it is intrinsic, it too is part of a continuum that moves toward and away from balance at different times, and is different for every person. We can make educated guesses about standards and norms, but in the end we have to take into account the uniqueness of every person and chart we work with. Our practice is, in the end not a science but an art. Authors throughout astrology’s history have displayed a variety of technique for finding natal temperament. However, some factors are consistent and provide a main intermediate step towards outlining the analysis. A key consideration remains that there is no easy and definitive judgement method which is completely foolproof. Not only is the entire astrological picture important, but the context of the analysis will also be of note. This makes sense given that the human being is a dynamic and evolutionary creature. Nonetheless, as has been noted by many, there can still be a fundamental cloth from which one is cut. The calculation of temperament is the vital first step in analysis of the nativity. Skipping this stage leaves us ignorant of the nature of the beast with which we are dealing. No matter what the other indications in the chart may tell us about the nature, omitting this initial step leaves us ignorant of whether the nature in question is that of a tiger, a gibbon, a bull, or a giant sloth. This is a distinction of no small significance. Most of what we read from the chart, and certainly all that we read from it on the psychological and physical levels, must be read in the light of this initial distinction (if we decide that our native is a bad-tempered tiger we have more cause to worry than if he is a bad-tempered sloth!). This intensive (AP12) was first presented on the Gold Coast(GCAS) in June 2010 and in revised form March 2013.